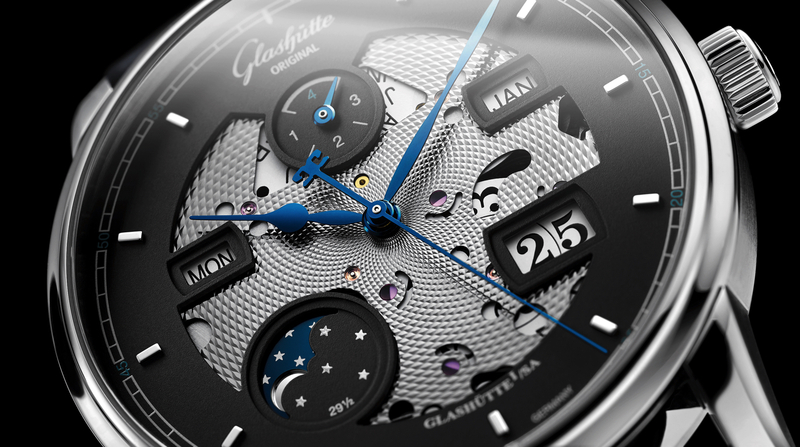 Glashütte Original just sent us a preview of their new Senator Panorama Date and Senator Panorama Date Moon Phase, which will be launched at Baselworld next month. 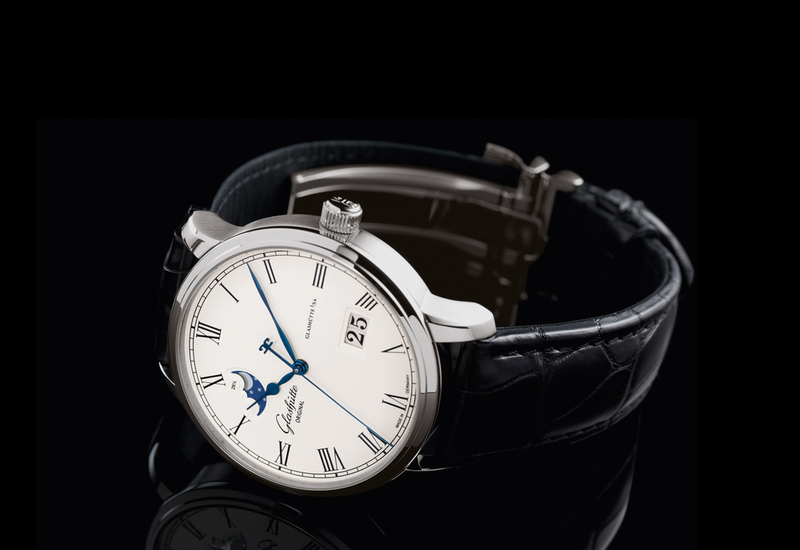 Glashütte Original made a number of changes to the existing Senator Panorama Date collection, that they say results in both a classic and contemporary look. The bezel size has been reduced to make room for a lacquered silver-grain dial. Printed Roman numerals mark the hours, along with a classic black railroad chapter ring. 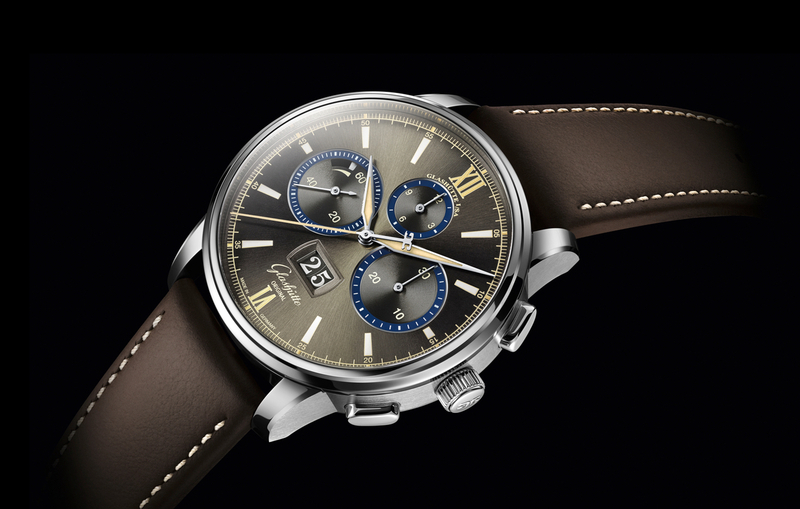 The panorama date is presented in a black and ivory, matching the color of the dial. The hands are “poire” shaped and in blued-steel. The Senator Panorama Date and Date Moon Phase come in a 40 mm stainless steel or 18K red gold case, with both polished and brushed surfaces. The strap features matte black Louisiana alligator leather, with a fold-over clasp in the same material as the case. There is also the option for a steel bracelet. The Senator Panorama Date is powered by the in-house automatic caliber 100-03, the Senator Panorama Date Moon Phase by the caliber 100-04, both with a 55 hour power reserve. The sapphire case back allows a view into the movement. Caliber 100 features a screw balance with 18 weighted gold-coated screws, twin spring barrels, swan-neck fine adjustment, skeletonized rotor with 21-carat oscillating weight, and the exquisite finishing characteristics of the manufactory.